When I was in high school a few (cough, cough) years ago, I was intent on building a strong resume and college application. I took AP classes, joined clubs and worked after school. The result? A grocery list of activities, with very little meaningful content. I struggled to make mowing lawns, working at Burger Mania, participating in the French Club and my GPA stand out in a sea of other job and college applicants. Today’s high school students have more opportunities and resources to help them build powerful resumes and college applications. 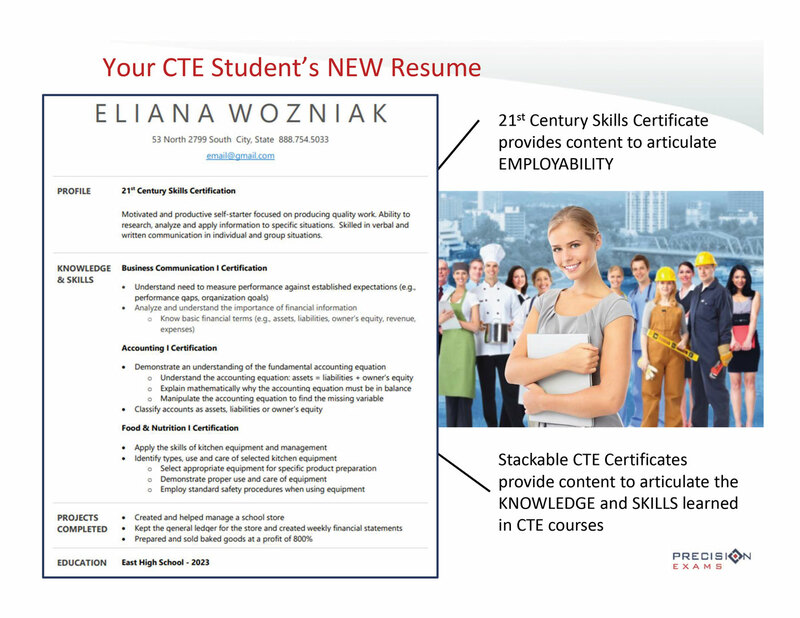 Specifically, CTE students emerge from their classes and programs with incredible amounts of knowledge, skill and talent – and they have the certificates, certifications and credentials to prove it. 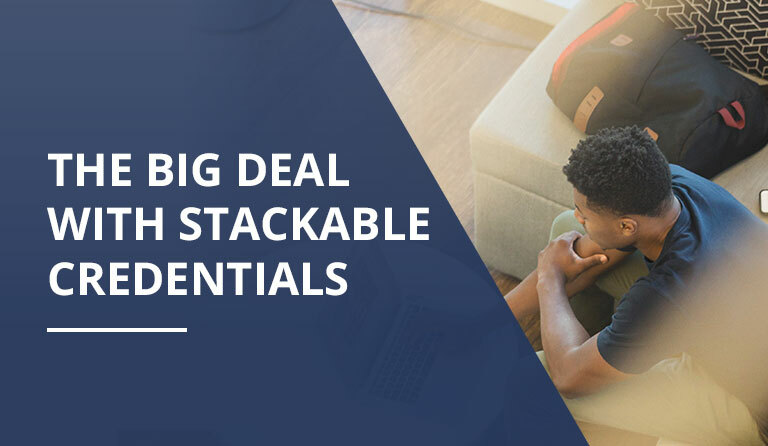 However, their biggest challenge is like mine years ago – how to take their grocery list of certificates and create a meaningful resume and college application. Fortunately, Precision Exams has provided a way to assist students with this challenge. One of my favorite benefits of a Precision Exams certification is not the stamp on the front of the certificate but what’s on the reverse side. 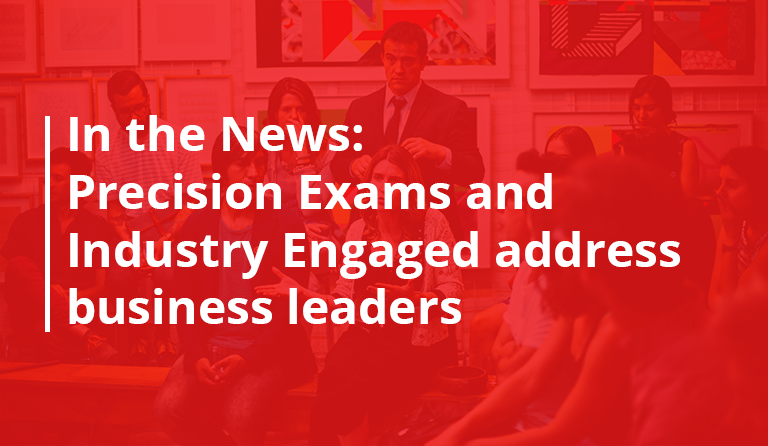 Precision Exams works with industry experts to ensure our exams assess, and certificates represent, the knowledge and skills students need for today’s careers. On the back of every certificate is a list of the knowledge and skills signified by the certificate. Students not only have a certificate recognizing the completion of a course, but they have a summary of what they learned! 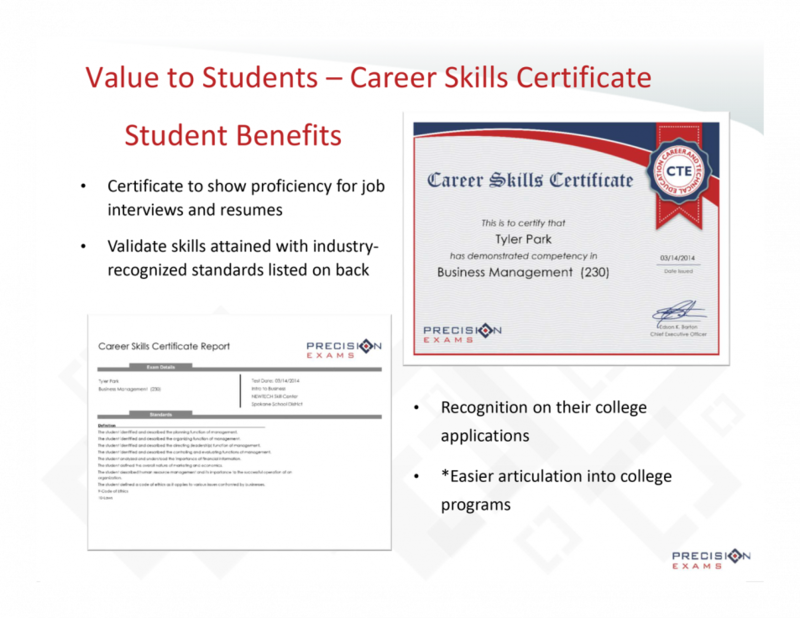 Armed with the content listed on the back of their certificate, a student can create a skills-based resume or application that is meaningful to future employers and post-secondary education. 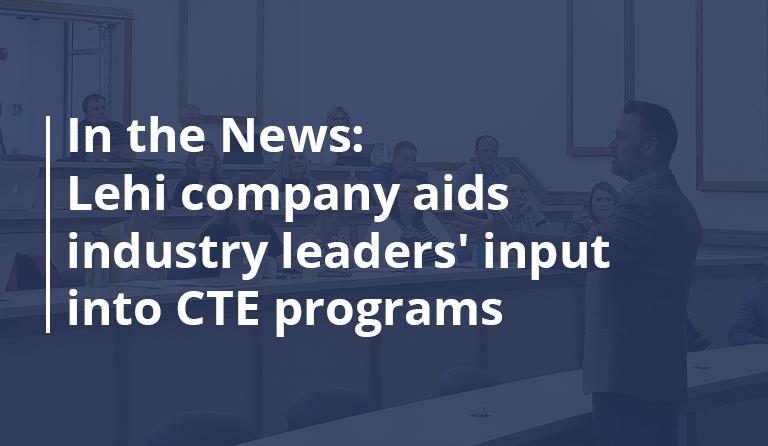 Counselors, teachers and parents should encourage students to use this valuable information for the students’ benefit. I wish I had a copy of my first resume and college application. Written in the DOS version of WordPerfect, I guarantee there wasn’t a lot of content to make my days mowing lawns, flipping burgers, parlez-vous-ing franscais and doing homework sound particularly valuable. 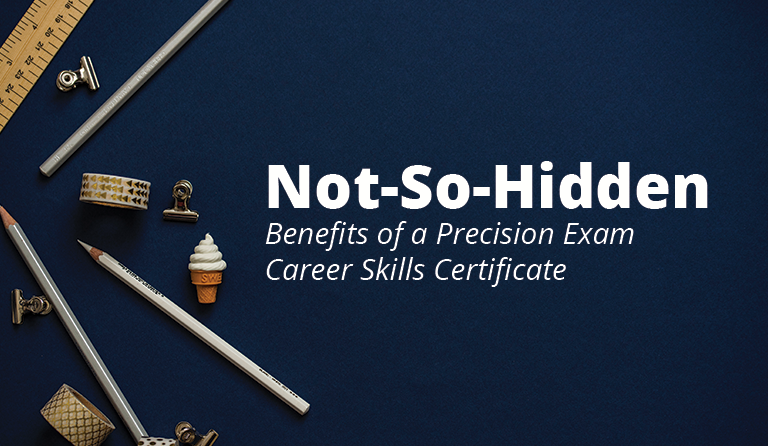 Compare my limited content to a thoughtful, content-rich, skills-based resume and you can see the value of a Precision Exams Career Skills Certificate – particularly the reverse side!